NASHVILLE, Tenn. (August 18, 2016) – Dolly Parton fans and SiriusXM subscribers are having a great week! Not only is Dolly’s highly-anticipated new albumPure & Simple available Friday, August 19, but Dolly Parton’s SiriusXM special is also airing on Willie Nelson’s SiriusXM channel, Willie’s Roadhouse! The special will debut on Friday at 11am ET and 6pm ET, with re-airings on Saturday at 10am ET and 7pm ET and Sunday at 3pm ET and 11pm ET. 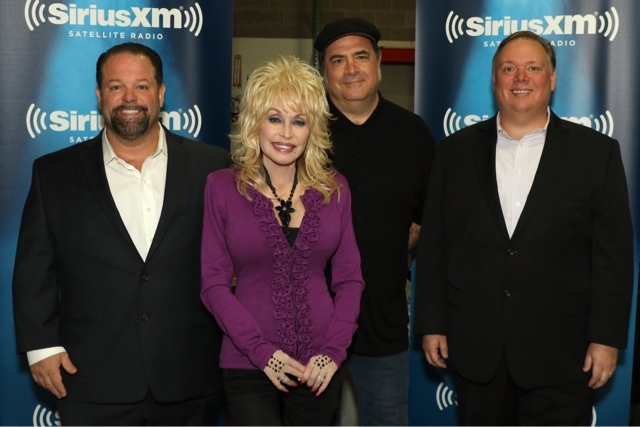 Additionally, SiriusXM has declared next Friday, Aug. 26 “Dolly Day,” on Prime Country and will air the Dolly Parton: “Pure & Simple” special on the Prime Country channel at 9am ET, 3pm ET and 10pm ET. Click here to purchase Pure & Simple. Summer looks to be ending with quite a bang for the Icon, with the August 19 release of Pure & Simple, as well as the highly-anticipated The Complete Trio Collection, a three-disc collection of all of the recordings from the 1987 and 1999 albums that paired her with Linda Ronstadt and Emmylou Harris. Together, they achieved four top-tens from the first collection – including the # 1 “To Know Him Is To Love Him” and the Grammy-winning “Telling Me Lies.” Rhino will issue that collection on September 9. Pure & Simple – a collection of love songs - has garnered glowing reviews, prompting USA Today to say “After half a century’s worth of performance, Dolly Parton’s voice still bubbles like a freshly popped bottle of champagne.,” and Sounds Like Nashville to utter that “the new material here shines the brightest – and that is a very good thing that she continues to grant us occasional glimpses into her genius – as well as her imagination!” The new disc will be available in a regular edition from Dolly Records/RCA Nashville, plus an exclusive version for Walmart that includes a second disc of Dolly’s Biggest Hits. In hosting the radio show herself, the songstress goes back to her roots, as she gained her earliest exposure as a musical act on Farm and Home Hour, Knoxville businessman Cas Walker’s radio show on WIVK in the 1950s.